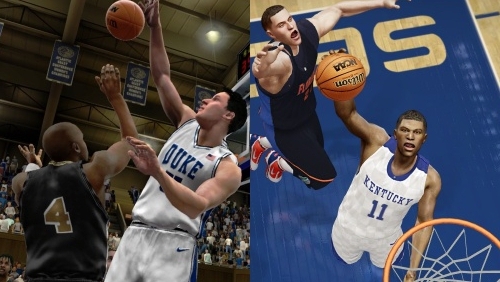 Both EA Sports and 2K Sports abandoned college basketball video games earlier this generation. What it came down to was college games, outside of football, simply don’t sell well – and they open themselves up to ongoing litigation regarding the use player likenesses. The recipe was one of high risk and low reward. Both companies – along with many others – have instead decided to dedicate resources to proven properties with greater potential return rather than investing in those that have little upside. 2K dropped out after College Hoops 2K8 (which will be remembered as one of the best sports games this gen) as the market simply couldn’t support two competing titles. Considering development costs the market was found to not be substantial enough to even support a single game. Only two years later EA bowed out following the disappointing NCAA Basketball 10. I’ve continued to hear rumblings of a college basketball game in the works at EA Sports with the plan to release it bi-yearly. When, or if, that will end up materializing remains uncertain. There could be a window now though with the NBA lockout offering increased exposure for college basketball that goes beyond just the boom that is March Madness. The idea however that all of the sudden a college basketball video game would sell a significant amount more given the NBA situation than it would have otherwise is a faulty one. If that was the case the TV ratings for college games would be on the rise right now. The only one that has registered a blip so far was the ‘Carrier Classic’ given its heavy promotion and airing on CBS ESPN in primetime with the unique setting of playing on an aircraft carrier. A full-featured collegiate offering could be difficult to package as a digital-download, though EA did try somewhat with NCAA Basketball 09: March Madness edition which focused solely on the tournament. It didn’t sell all that well but the economic climate has changed and digitally distributed titles have become much more accepted since then. All of this though still ignores that eventually the NBA will be back and the professional league titles will completely overshadow a college game that would presumably release after them on the schedule. It could try the February/March release time frame to capitalize on the tournament and distance itself from them but EA has experimented with that in the past and there was no positive effect on sales. The player likeness lawsuits have not been settled either making it a questionable decision to put out an additional product that could end up costing the company in damages in the future. While the non-existent NBA season would have been a perfect opportunity for a company to offer up a college basketball game none could take the risk that it would play out this way as they still far outweigh the rewards. That won’t necessarily be the case forever – and the NBA is helping that process along with their extended lockout.